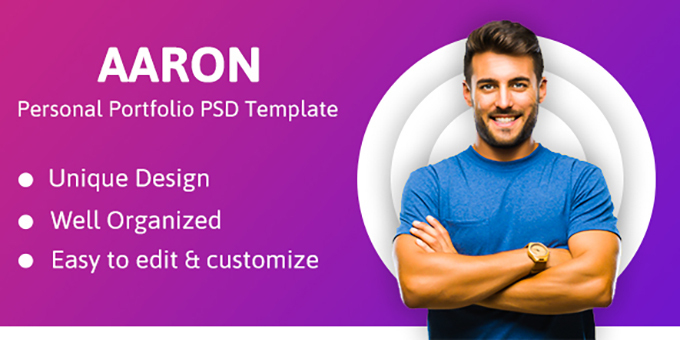 Aaron - Personal Portfolio PSD Template Is a modern PSD creative person and freelancers. Graphic designers or any kind of creative is now able to create a quick and easy portfolio to describe the experience and their work with a distinctive and creative touch. . This PSD template can be easily customized – each PSD file is carefully layered and the layers are grouped & named so you can access the layers & edit all the contents easily. You can easily replace any picture by your own one in just a few clicks. Please Note: All the images we have used in this template are just for preview purpose only. They are not included in the main purchased file.